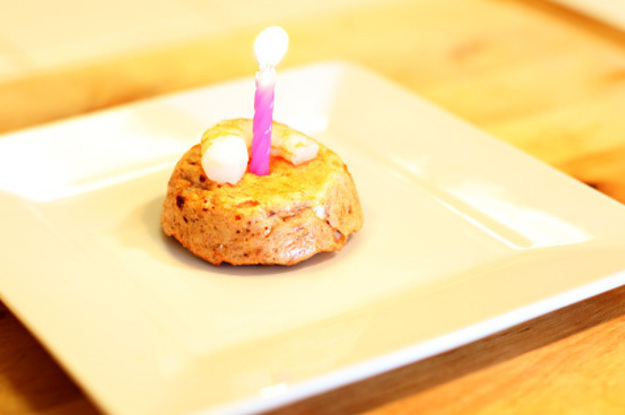 A Birthday Cake For Your Cat? Just a fun thing to see how people treat there pets. So easy anyone can make it! Recipe via yyhh.org. Note: This recipe will yield two cakes, so feel free to halve the portions… or enjoy one cake WITH your cat! 1. Start with half a can of tuna. 2. Measure 1 1/2 tablespoons of all-purpose flour. 3. Take a pinch (about 1 teaspoon) of shredded cheese. Any kind will do, whatever your cat will like best. In this case, we used shredded colby jack. 4. Crack the egg and separate out the egg white only. 5. Mix all ingredients together in a small bowl. The result should look like a chunky cake batter. 6. Using a muffin tin, apply cooking spray to prevent cake from sticking. 7. Fill muffin tin with the cake mixture and place in the oven. 8. Set a timer for 15 minutes. 9. While you wait, rinse off the shrimp and cut off the tail. By now you may have attracted some attention. 10. Once thoroughly cooked, remove cake from oven and place on a plate (or rack) upside down to cool. 13. Present to your lil’ birthday girl/boy. Be sure to blowout/remove the candle before your cat starts eating! Now sit back, relax, and watch the show! Can’t get enough cats? Sign up for BuzzFeed’s “This Week in Cats” newsletter and you’ll get all the cutest kitty news every Friday!